Figure 2 from page 4 of the brief: Environment among the factors of tensions and conflict. Produced by Zoï Environment Network, April 2018. The destruction and over-exploitation of natural resources and ecosystems can increase the risk of violent conflict. Competition over declining natural resources such as fresh water, fertile soils, fisheries or forests may affect livelihoods and indirectly increase the risk for conflict. Climate change may exacerbate existing challenges, and has been addressed on international levels as a serious aggravating factor to violent conflicts. Generally, the risk of conflict is higher in fragile contexts than where governments or society have the capacity to cope with the challenges. This nexus brief* sheds light on the nexus of environment, climate change, fragility and conflict. In the last few years, this nexus has been increasingly discussed on the global, regional and national levels. This brief provides an overview of the complex interlinkages, and focuses on conflicts related to declining natural resources. It discusses the impact of environmental degradation on people, the rise in the number and intensity of conflicts globally and the potential for climate-related conflicts, and what can be done to respond to these challenges. Figure 1 from page 3 of the brief: Interlinkages between environment and conflict. Produced by Zoï Environment Network, April 2018. Violent conflicts are increasing in number and intensity. Most are occurring in Africa, the Middle East and South Asia, and are the result of complex interactions among multiple factors, including some related to the environment. Environmental degradation, exacerbated by climate change, does not automatically lead to conflict, but can affect such drivers of conflict as low rural incomes or food insecurity. Where society, institutions and governments are unable to manage the challenges related to these drivers, the risk of conflict increases. 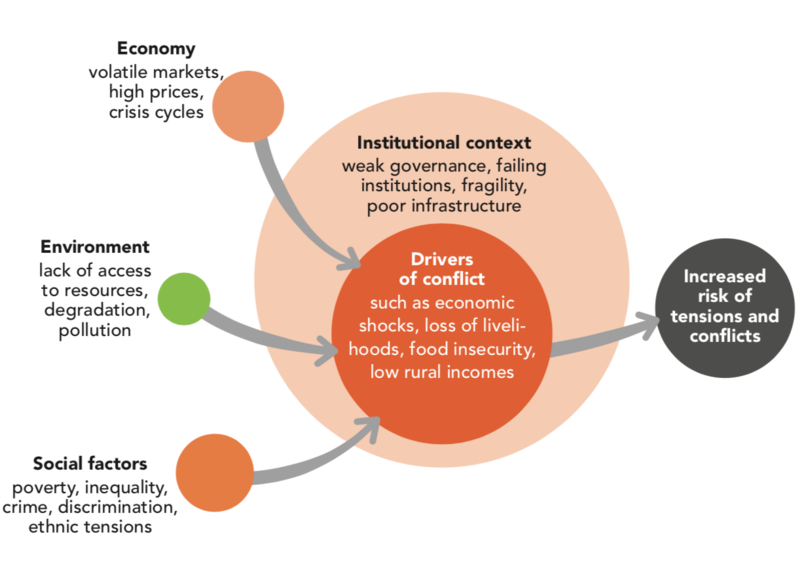 States of fragility often find themselves in this situation, but further research is necessary to better understand the relationships among the environment, climate change, fragility and conflict. Numerous international actors, including the UN General Assembly, the UN Security Council, NATO, OSCE, the European Union, the African Union and the G7, have recognised the nexus of environment, climate change, fragility and conflict. A dedicated international process on this nexus could improve the common understanding of the dynamics at work in the same way that the Nansen Initiative responded to the challenges of displacement in the context of disasters and climate change. The key to reducing the risk of conflict is a preventive approach. Managing shared water resources can increase confidence across borders, prevent conflicts and promote peace. Development cooperation can support local and national measures for sustainable agriculture, land restitution and democratic institutions. Countries with a history of armed conflict have an increased risk of falling back into conflict. Where environmental factors are root causes or underlying reasons leading to the outbreak of an armed conflict, these factors need to be adequately addressed in conflict resolution and in respective peace agreements. Kohli, A., Steinemann, M., Denisov, N. and Droz, S. (2018) Fragility and Conflict. Climate Change & Environment Nexus Brief. Swiss Agency for Development and Cooperation: Bern, Switzerland.